As you may know, I am a recent convert to a lifetime of healthy eating. After having lost 85 pounds, I am in no hurry to regain ANY of it, and am always on the lookout for reasonably low calorie snacks. Snacks are one of my weaknesses. Love snacks. I heard about this recipe and tried it. And liked it! Only two ingredients. Easy to make. And both tasty and low calorie. Break the crackers where they are scored. I made 50 calorie snacks, so broke each large rectangle into 4 pieces. Set half of the crackers onto a cookie sheet or cake pan (size it so that it will fit into your freezer). 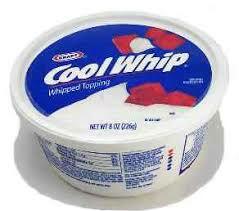 Let the cool whip soften a bit. You want it to be spreadable, but not "soupy". Spread a tablespoon or so onto one half of the cracker pieces. Place the other half of the crackers on top to create sandwiches. Put the pan into the freezer until the sandwiches are fully set. I package them separately in snack size ziplock bags. And then have an ince cream sandwich (1 WW pt.!) at the ready! We have signed up for a CSA (Community Supported Agriculture) and will be getting a (random? surprise?) box of frutis and vegetables each week, so be on the lookout for recipes that use my new vegetables and the things from my garden. Love the summer produce season! I love snacks! Thanks for this great idea. My kids will love it too!